For the IBF, WBA, WBC, Middle weight championship of the world. With only weeks to go until these two fighters face each other on the biggest stage of all, both of them will be ready to do what needs to be done. Both have sacrificed themselves in training, and both have given everything they could to be the best they can be on May the 4th. Both of them have well over a decade of ring experience , fighting their way to the top of the middle weight division. Daniel Jacobs [35-2 – 0 with 29 ko wins] made his debut in 2007, and since that time, he has fought Ishe Smith, Dmitry Pirog, Caleb Truax, Sergio Mora [ twice] Peter Quillin, Gennady Golovkin, Luis Arias, Maciej Sulecki, and Sergiy Derevyanchenko. He has lost only to Pirog [ overhand right hand in the 5th round ] and Golovkin [ points win, although being down by a short right hand ] Jacobs has been down , criticised by the boxing media , and also given the hardest blow , being diagnosed with a bone cancer, and yet he still refused to quit, and fight through life to become champion of the world. Saul Alvarez made his debut at 14 years of age, in 2005, fighting in the beer and piss stained Mexican boxing halls, fighting for nothing, but fighting strong with the mindset that things would get better as long as he kept winning. Boxing was his life, and winning became part of that life. In 2010, he challenged the super welterweight champion, Carlos Baldomir, and took him out in 6 rounds to win his first world title. From there, he has fought big names in, Shane Mosley, Floyd Mayweather, Erislandy Lara, Miguel Cotto, Amir Khan, Julio Cesar Chavez, and Gennady Golovkin, [twice] and has won, defended, and stepped up in weight to super middleweight to beat Rocky Fielding in 2018. It has to be said, although on paper, Mayweather is the only boxer to beat Canelo, there is still question marks over his points wins against Golovkin. Canelo took a lot of criticism for the first fight, and also what transpired after the fight in the lead up to the rematch. He was called out for being a drug cheat and going into the second fight with GGG, he must have had a lot to think about. In saying that, Canelo fought a better fight in the rematch but still got another controversial decision in Las Vegas, to take Golovkin’s belts. Cause we are the champions of the world. For me, this fight will go down as one of Canelo’s best performances in the ring to date. 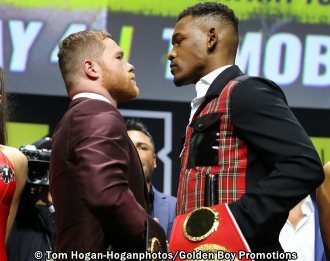 I think Jacobs has size, height, reach advantages , and has great boxing ability, but I do think Canelo will put enough pressure on to get inside, going to the body and then going for the uppercut and hooks, particularly the big right hand. I don’t think Jacobs will cope with the pressure, the speed, and the movement of the Mexican . 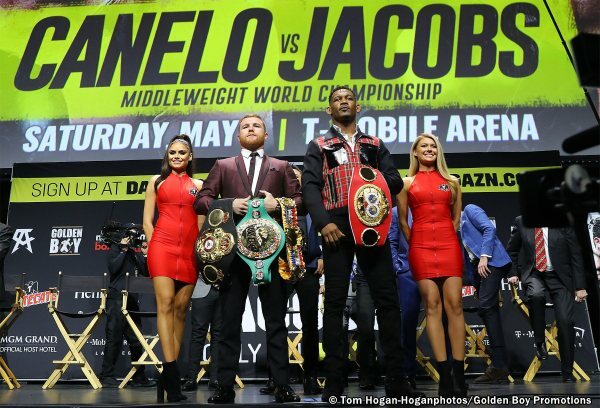 The only way Jacobs has a fighting chance to keep on his feet is to hold, and fight , using his strong jab, doubling up and trying to tire Canelo out. Jacobs has a solid defence but it will be hard to defend his chin and his liver for 12 rounds. Canelo does fight in spurts and he goes to the ropes as a breather or to take rounds off. Jacobs has 29 ko’s on his record, but he has never fought anyone who can make you miss like Canelo Alvarez. On the other hand, Canelo has fought them all, and most of the time, he has always found a way to win. Gary Todd is the proud author with his books on boxing’s greatest champions, “Workout’s From Boxing’s Greatest Champs . Vol. 1 and 2. He has been involved in all aspects of the sport of boxing for over 30 years. Click here to view a list of other articles written by Gary Todd.